I spent a very fun and educational morning with winemaker Assaf Paz at his family's winery, Vitkin, which for the last few years has been one of my favorite local wineries. 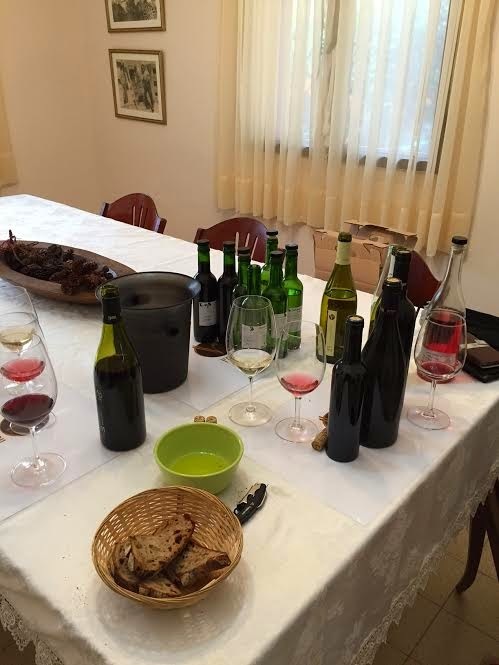 We tasted some work in progress specimens, some back vintages and some recent releases. The only wine we didn't sample was the flagship Carignan, because, as I'd told Assaf, I've had it so many times it'd be a waste of our mutual time to go through it. I told him that as far as I could recall recall I hadn't a lot of much experience with the Petit Sirah, so he opened a back vintage of that - which was a very, very good idea, as I'd learned that we with enough (read: long) bottle age, the Petit Sirah gives the Carignan a very decent fight. Assaf's philosophy is to make interesting, fruity wines, that pair well with food, don't necessarily require a lot of bottle age and that are imbued with local character. At the same time, he also wants to make wines that will intrigue the illumenti. And turn a profit while keeping his professional integrity. Which is probably a blanket statement you'd get from a lot of wineries. You have to taste through the range and listen to Assaf's rationale for winemaking decisions he made for specific wines to see how well the unofficial mission statement works out in practice. We started out with a tank sample of a mystery grape that will probably go into future White Journey blends. Whatever it is, the sample was spicy/herbal with good acidity and a touch of anise. We then moved on to a sample of Grenache Blanc that had spent a relatively short time in barrel. Here, the oak was obvious, but not blatant - rather it served as a signature, a spicy wisp. It was fatter than the mystery sample, with lower acidity, but in both cases, as I told Assaf, I'd be happy if was served in a carafe in some bistro around the Mediterranean basin, which was probably his intent in the first place. At this point, we tasted some finished wines. The White Journey, 2014 was open for business on the nose, with the Gewürztraminer in the blend showing rose water and lychee. The palate was more sullen, though. The 2013, a blend of said Gewürztraminer, French Colombard and Viognier (the 2014 presumably contains the mystery grape, which, by process of elimination, I think is Sylvaner or Muller-Thurgau) is nuttier and fatter. Both have very good acidity.The combination in each vintage works quite well, and really seems to project the occidental character Assaf aims for. We then moved on to the Grenache Blanc, 2013. If there is one wine I really longed to taste (and buy, by the way), a wine worth the drive to Vitkin, this was it. Although I have to say I'm usually not very fond of Rhone white grapes and wines, this avoids the oaky, oxidized character I often encounter there, instead showing a unique signature of peanuts, minerals, ash and tobacco leaves. This is intellectually stimulating, existing in the same niche for me as Savennieres, a wine that challenges first and pleases later. Complemented by a side dish of Carignan and Tempranillo, this is fruity yet restrained, with a touch of minerals. Quite nice. A good Mediterranean Pinot. Meaning I get both the Pinot and 'local' aspects. It's rich and complex with earthy and leathery notes, more tannic and foursquare than any Bourgogne I'd buy. The Red Journeys have been very good lately, and the only reason I don't buy any for my fridge is that I wind up ordering them quite a lot off of restaurant wine lists. This particular vintage is charming ,floral and fruity, and it should eventually show a tasty, mineral tint, if it is anything like the 2012 version. This has a lovely, piercing nose, with typical lead pencil. The fruit is sweet yet balanced. And finally, proof that Assaf makes wines that can age! This has a spicy, mature appeal (petrol and herbs), with a unique signature not of Pfalz or Alsace, that I find holistically captivating despite a few off notes that make their way in and out of my attention span. Once more, a very captivating nose, with black fruit, bacon and leather. It is still tannic and drying, so I think it could go a few more years, probably always remaining tannic. This was clearly my favorite wine of the visit, and I have to admit it preyed on my mind on the drive home. Post-script: Assaf planned to taste the Late Harvest, 2011 with me, but we didn't get around to that, so he gave me a bottle to try at home. 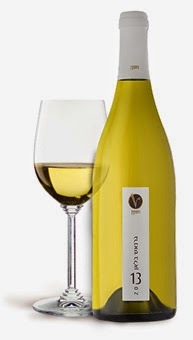 This is a dessert wine comprised fully of Sauvignon Blanc, which goes some way to explaining the similarity to Sauternes. I'm no longer a big fan of Sauternes, so for me, the relative lightness is definitely a boon. An enjoyable wine. The fun and education was mutual. Soon to release the new White and Pink Israeli Journey 2014.